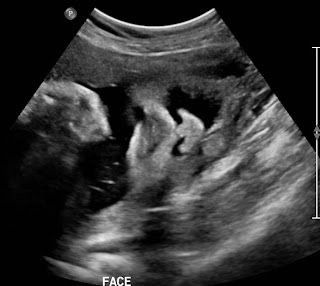 Well, we had the ultrasound yesterday to investigate why I was so big. We were so lucky to have the best technician. Right from the beginning he tried to put me at ease, and he let me watch the whole exam on the screen, which was really neat to see. He says that Baby is measuring about 37 1/2 weeks, which is about 2 1/2 weeks ahead. But he says that is within normal range, and that everything looks perfectly normal. He also confirmed that yes, Peanut is definitely a boy! It's a nice relief to know that he thinks nothing is wrong, and we don't have to wait impatiently for the call from the doctor. Thanks for all the happy thoughts and words of encouragement. They helped tremendously. We are so lucky with this pregnancy, and can't wait to meet our little man! Yay! Glad to hear everything is good! Take care of yourself and enjoy these last few weeks of pregnancy! horay!!! Glad to hear your worries were put to rest! Wait to meet him that is. Just read my comment and realized it didn't really make sense (haha...oops).